The higher increase in the base lending rate (BLR, to which lending rates are pegged) compared with that of the benchmark overnight policy rate (OPR) has raised more than eyebrows among consumers. “This is totally unacceptable,'' a reader wrote in an email to StarBiz. “Banks will be making higher margins at our expense. “If you look back since Bank Negara cut the OPR to 2% and then increased it back to 3%, the BLR has increased at a faster pace. Back in 2008 when the OPR was 3.25%, the BLR was 6.5% but now the OPR is at 3% and the BLR is at 6.6%. “Bank margins have expanded by 35 basis points (one basis point is one hundredth of 1%). With RM900bil in total loans, this expands banks' profits by RM3.2bil at the expense of consumers. “Also, when the SRR (statutory reserve requirement interest free deposits banks must keep with Bank Negara) was reduced from 4% to 1% of deposits, the savings were not passed on. But now that the SRR has been raised back to 3%, banks expanded BLR by five bps. Effective May 11, the BLR went up 30bps (to 6.6%) which is higher than the OPR increase of 25 bps. This speedier repricing of loans relative to fixed deposits may be mildly positive on bank margins in the near term but have already got some consumers up in arms. “By our estimates, the additional 5bps increase in the BLR sufficiently compensates for the recent 100 bps increase in SRR to 3%,'' said Maybank IB, adding that this was probably an ad-hoc adjustment rather than to specifically compensate for the SRR hike. RHB Bank principal officer Renzo Viegas said each banking institution could introduce its own BLR based on its cost structure and business strategies. Under Bank Negara's new interest rate framework issued in 2004, this was allowed to provide more efficient pricing of financial products. But for most banks, the OPR is a key variable in deriving the BLR. “Assuming that cost structure and business strategies remain intact, it is therefore not surprising that with every OPR hike or contraction, the BLR will adjust in tandem with the change in OPR,'' said Renzo. There are mixed views on regulatory intervention to prevent the rise of BLR following an increase in OPR. “It is best that market forces determine the trajectory of interest rates,'' said Malaysian Rating Corp Bhd (MARC) vice-president and head of financial institution ratings Anandakumar Jegarasasingam. Banks are likely to experience a narrowing of net interest margins with the recent OPR hike which is concurrent with the upward movement in the SRR coupled with intense competition, said RAM Ratings head of financial institution ratings Promod Dass. “However, banks with a large proportion of their funding base composed of low cost deposits (current and savings accounts or CASA) and a predominantly floating rate loan book will be able to better mitigate this trend,'' Promod said. Renzo sees that for banks with a high fixed rate loan book, this may have a negative effect on margins. For banks with high floating rate books and strong CASA to fixed deposit ratio, the OPR hike will likely improve the overall net interest margin, said Renzo. 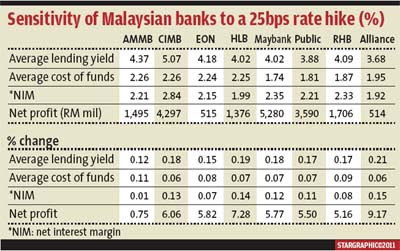 According to Maybank IB Research, the prime beneficiaries would be Maybank and CIMB which have a lower proportion of fixed rate loans and higher CASA base. 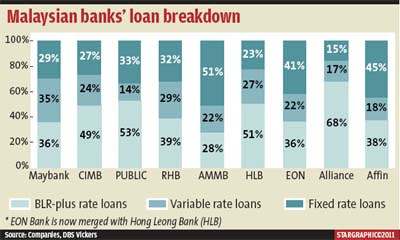 Hwang DBS Research, in its update on Asean banks, had identified Maybank, Hong Leong and Alliance as having a higher proportion of variable rate loans and CASA. However, higher rates may affect the repayment ability of some borrowers. “Any potential default as a result of this is likely to be manageable at this stage,'' Anandakumar said. Analysts estimate about 55% of the total loan portfolio of banks comprises consumer loans, which include 24% to 25% in mortgages. Besides the BLR, another indicator is the average lending rate which can vary especially in the cut-throat mortgage market. “Pricing strategies deployed by banks would generally result in narrower margins,'' said Anandakumar. However, that could result in expanded market share. To compensate for the lower margins, banks have other strategies such as packaging lending products with lock-in periods and insurance products. They have also made their deposit structures more attractive to ensure a supply of low-cost funding, he added. “When all banks gravitate towards homogenous pricing across the industry to capture market share, the margins will definitely compress,'' said Renzo.